Celiac disease has been mysteriously on the rise in recent years but a new study has linked some celiac-like symptoms with the use of olmesartan, a popular blood pressure medication commonly sold under the name Benicar. 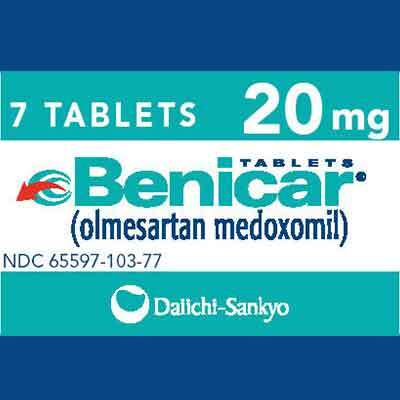 Benicar is a hypertension medication also known under the generic name olmesartan. It is an angiotensin II receptor blocker (ARB), preventing an increase in blood pressure by blocking the action of the substance angiotensin II. Olmesartan is widely used; in 2012 alone, more than 10 million prescriptions for it were filled. There are several ARBs on the market but Benicar is the only one with reports of severe GI side effects. These gastrointestinal problems, especially when they involve “sprue-like enteropathy”, can be mistaken for celiac disease, an autoimmune response triggered by the protein gluten, found in wheat. In celiac patients, the symptoms tend to get better when the patient removes wheat from their diet. When the symptoms are caused by Benicar, however, the symptoms remain even after gluten is eliminated. A study recently published by Wegmans School of Pharmacy, at St. John Fisher College, supports a link between olmesartan and severe gastrointestinal symptoms. The study involved a literature review of cases from 1965 through November 2013 and found evidence supporting an association between olmesartan use and sprue-like enteropathy. The researchers conclude that their results warrant further study. They also caution that doctors should be aware of the relationship between the drug and symptoms because the symptoms can be life-threatening. The research published by Wegmans School of Pharmacy is not the first study to link the use of Benicar to severe gastrointestinal symptoms. Dr. James Murray at the Mayo clinic found the connection when treating patients with severe and life-threating celiac-like symptoms between 2008 and 2011. Dr. Murray notices that 22 of the patients were on a course of treatment that included Benicar. Two thirds of those patients had symptoms so sever that they needed to be hospitalized; they lost, on average, 40 pounds. One patient lost well over 100 pounds. In July 2013, the U.S. Food and Drug Administration (FDA) took notice of the dangers of Benicar. It warned that the drug, which is not recommended for use in pregnancy or in patients with a history of GI problems, can cause sprue-like enteropathy. The FDA required the manufactured change its label to reflect the risk of sprue-like enteropathy. The symptoms of sprue-like enteropathy include chronic diarrhea and weight loss. Onset of symptoms can be delayed for months or years after use but in some cases the symptoms are so sever enough that hospitalization is required. Earlier this year victims began filing the first Benicar lawsuits for the sometimes life-threatening gastrointestinal effects; more lawsuits are expected.